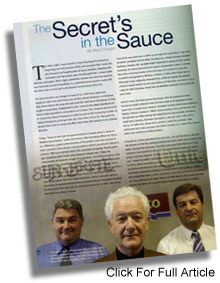 The November issue of Partners magazine, features Unico and Sun-Brite canning and its owners. The article features Sun-Brite's astronomical success. Its original 5,000 square foot facility has expanded to a state-of-the-art 140,000 square foot plant able to process 2,500 tons of tomatoes per day. Unico is the number one Italian Food distributor in Canada. Through national television, print, and radio advertising, Unico is synonymous with Italian food. The Toronto Sun puts tomato sauces to the test using a panel of Italian Seniors. Out of the 12 commercial pasta sauces tested, Unico Sauce came out on top. The ladies had this to say about Unico's sauce "It looks like our sauce, smells like our sauce and tastes like our sauce... if we didn't know better-you'd think we had made it!"